Salads make wonderful meals especially during hot weather days. Here’s a recipe for a sassy chicken salad courtesy of Redpack Tomatoes. It brings together tomatoes, grapes, chicken, celery, and toasted pecans to form refreshing meal. 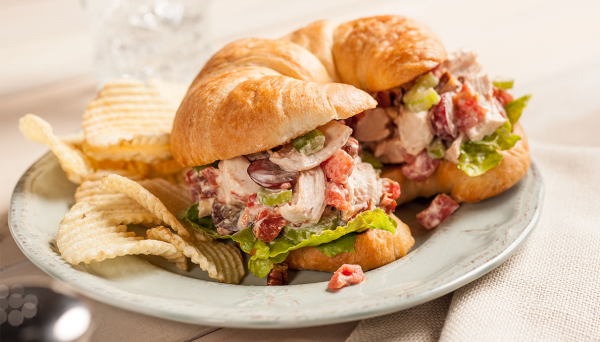 Make a chicken salad sandwich or nix the bread and simply serve it over a bed of greens. In a medium bowl, combine tomatoes, mayonnaise and honey. Stir in chicken, celery, grapes and pecans. Cover and chill, until ready to serve. Redpack Tomatoes has many more easy salad recipes to share as part of their “Toss in the Flavor Promotion,” now through June 10th. Recipes feature their tomatoes along with seasonal fruits and vegetables. As a part of the promotion, they are hosting a sweepstakes on their Facebook page for a picnic gift basket filled with all things to help you put together your favorite summer salads.